January 2012 was my first blogging organizing January. I implemented several organizing schemes and I think it informative for me to report back on them 1 year later. What good is an organizing scheme if it doesn't stay organized? I'd consider it a design fail. So let the truth be told. Here is the report card on 3 of my ideas. 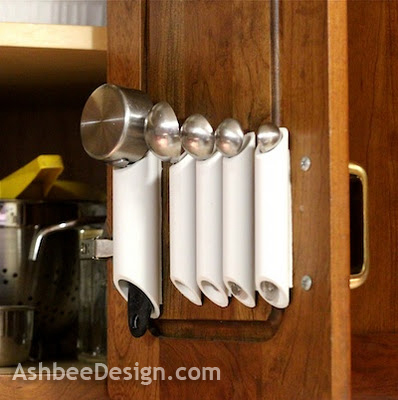 We have all seen the pins of the measuring cups and spoons hanging on little hooks inside the cabinet doors. I loved the idea and went to implement it. My husband said - no way! The clattering noise he heard each time he opened the cabinet would lead to an early heart attack so we reconsidered. Instead of the hooks we used PVC and created storage columns for the cups and spoons. The idea works beautifully to a point. We still use it and always know the spoons and cups are either in the dishwasher or on the cabinet door. The one problem that did develop is with the attachment technique. I used double stick foam tape. That has been fine for all the measuring spoons and up through the 1/2 measuring cup but the weight of the 1 cup was too much and it did fall off. It will need to be screwed in place. I only used the foam tape as a temporary solution and because I was afraid of drilling through the cabinet doors. I will fix this because the idea and solution is still excellent. And they don't bang and make noise! 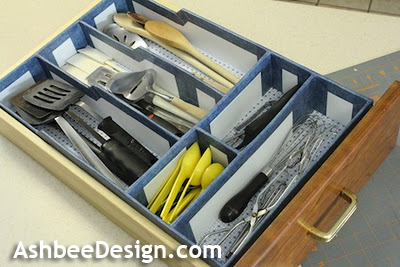 My kitchen drawer had dividers however they were inappropriately designed for the task and they wasted about 50% of the available space. I wanted to design an easy-to-make system that maximized usable space. Instead of wood I used corrugated plastic sheeting held together with designer duct tape. I increased the height of the drawer sides and reduced the space taken up by the dividers. 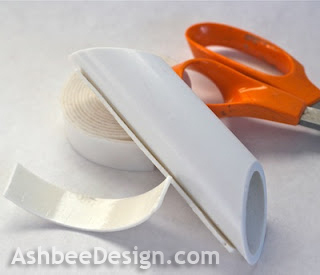 • Don't use the designer duct tape. It isn't as sticky as Duct Tape and it started unsticking within two weeks. I have since added real Duct Tape to all the seams and the problem has gone away. It now stays stuck! Colors aren't as varied but it works much better! • Watch the height! I wanted to maximize storage so I made the walls as tall as I could. I needed to leave at least 1/4" space between the top of the plastic wall and the bottom of the wood framing of the cabinet. When summer came the humidity caused the wood framing to swell enough to rub on the plastic walls. The drawer works much better in the winter. I needed to leave a little more space for swelling. There are all kinds of nifty things to buy for cable control and there is also the great post about toilet paper tubes but none of these address the need for cable control when you are a couple of geeks. Cable control takes on a whole new level of extreme need and I tackled that last January. My solution included IKEA Kassett boxes, lots of ziplock baggies and colored Duct Tape. This has been hugely effective. 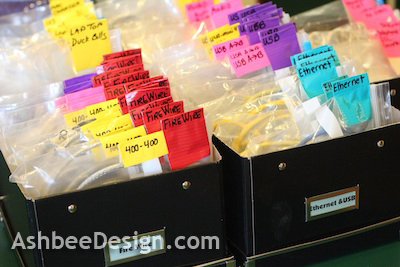 It is still neat and orderly and all year long we have been able to find the cables we need quickly! I will continue with this system and occasionally weed through it to discard cables from old technology. Final grade A+! I think it is valuable to report in on our design solutions after a year. We share so many ideas and as they cross my screen I wonder how many are keepers and how many get discarded quickly. I plan to continue reporting in occasionally with one-year-later reports so you can get reviews of effectiveness right from the source. Two things that have simplified my life all out of proportion to the work involved: I hung every blouse/sweater/jacket by color rather than by season or whether it was a dressy or casual occasion. All the red tops (including shades of pink)are together, etc. This has made getting dressed much easier - all the tops of a specific color are in the same spot in closet. The second thing was that I tossed my jewelry box. I have a small dresser with such shallow drawers that it was practically useless. I put the "egg" side of egg cartons the top drawer; each "egg" holds a pin, a necklace, or a set of earrings. The plain side of the cartons can hold bracelets. The cartons are easy to cut so that the rows of "eggs" can be trimmed to fit your furniture. The cartons can be easily changed when they get bent or dusty. I rearranged all my clothes by color once as well - in rainbow order no less! It was a very helpful way to raise my spirits one gray winter day. But it didn't stay that way- I like items sorted by use- dressy clothes together, casual together, etc. I also found a traditional jewelry box useless. I started wearing my jewelry much more often after transitioning to a wall mounted jewelry box. Posted about it here. Helps with tangled chains as well. thanks for visiting and commenting.